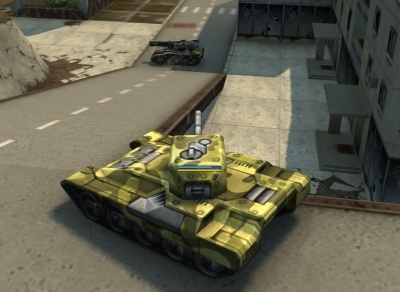 Most of the maps in Tanki Online have a really diverse structure. And while shooting at the enemy that is on the same level as you is fairly easy, hitting a tank that is considerably higher or lower than you is a lot more difficult. In the past each turret had a different sector of vertical auto-aim but now this parameter is almost the same on any weapon. 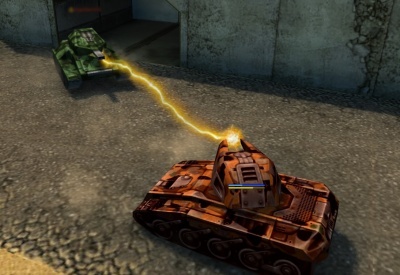 Overall, if an opponent's tank is located on the hill and attacking you, there are two ways to deal with that: drive off as far as possible and open return fire or move closer to be out of your enemy's vertical attack sector. When a target is below you, what you need to do is try to get to the edge of the cliff so that the front of your tank slightly bent forward and start shooting. Freeze and Firebird have the smallest firing angle, however the horizontal angle is twenty degrees which allows it to hit several targets at the same time. This page was last modified on 16 September 2017, at 17:52.